Everybody Needs a Tee! 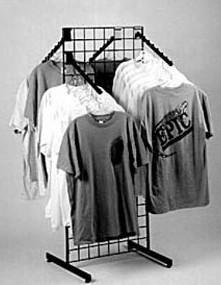 This Grid Tee-Shirt Rack offers an ideal solution for showing shirts off in your store. Four seven ball waterfalls keep your shirts from sliding together. 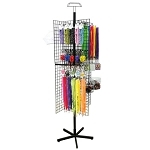 This tee-shirt rack is an excellent way to have a lot of shirts in your retail store on one rack in a gift shop. This shirt rack comes in black, white, or chrome and holds 56 tees. 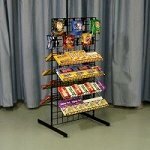 Order your grid shirt rack today for your shop.